Shai Utoh is one of the shorter shrines in Zelda Breath of the Wild. That doesn’t mean that you’ll finish it quickly. You can get stuck for a brief period of time, like me. This is if you are aiming for all the shrine treasure chests. 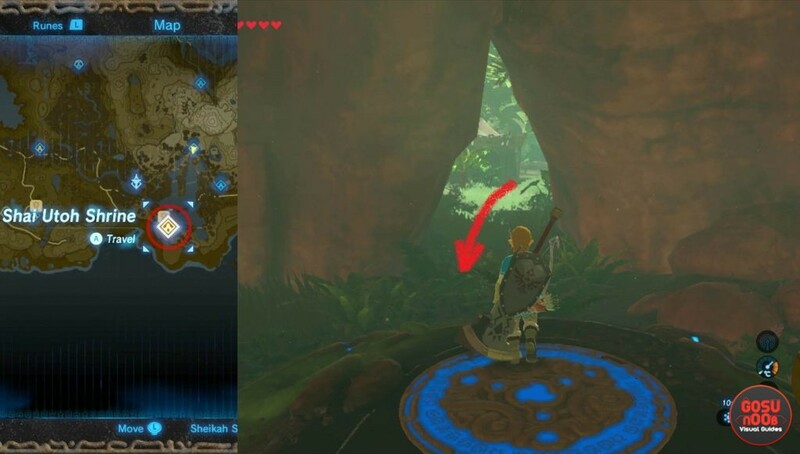 This guide will help you finish Zelda BoTW Shai Utoh shrine and beat the Halt The Tilt challenge. In southern Hyrule, there is an area called Faron. West from Lake Floria, you should spot Lakeside Stable. Head toward the mountains behind the stable, but don’t climb. Find a part of the mountain that has a breakable wall. Destroy it to reveal the shrine’s entrance. From the start, you’ll have to rely on the Stasis rune. Use it on the first seesaw to climb towards the upper floor. Stop the next seesaw to climb to your right, facing where you came from. On the next platform, there is a treasure chest with the weapon Soldier’s Broadsword (14 damage). First chest, be sure to pick it up with Magnesis later on. Head back to the seesaw and use it as a bridge towards the main shrine area. Now, this is very important: bring the chest with you. In the main room, you’ll notice two seesaws. The one that is closer to the wall is the one that we’ll use to reach the hidden chest. Step on it, raise the first chest high up in the air, just above the other part of the seesaw. Once you remove Magnesis and let go of the chest, it will fall down, sending you soaring into the air. Glide towards the chest to pick it up. It contains an Ancient Core, the key ingredient for the Ancient Armor Set. With the help of the first chest, we reach the second treasure.